Your favourite modern traction magazine is now available as a digital-only version. AS PROMISED IN last issue’s editorial, not only was RAIL EXPRESS No. 171 out on time – in most places – but we are now pleased to debut the digital-only subscription to the magazine, perfect for the emerging range of PC tablet products, including the iPad. Brought to you with our partner Zinio, 12 issues of the magazine costs just £18, a saving of £25 on a normal subscription and a whopping £29.40 off the cover price. You can find out more details about how to subscribe by clicking this link or the image at the top of this post. 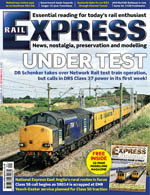 Of course, we still want to make it easier for you to be able to buy a physical copy of RAIL EXPRESS, and in an effort to improve our service in this area, you can now purchase the magazine direct from Morton Media’s online shop. Just visit this link for all the details. You can buy the latest issue and pick up a binder too! Back issues will follow soon, so watch this space. This entry was posted on Tuesday, August 3rd, 2010 at 7:00 pm and is filed under News. You can follow any responses to this entry through the RSS 2.0 feed. You can leave a response, or trackback from your own site. 16 Responses to More ways to enjoy RAIL EXPRESS! Hi there unable to find your new edition in any of the usual outlets that i buy it in ,within the Irish Republic. I’ll forward your message onto our publisher to kick some arse! For now you should be able to buy the magazine online and we will post it to you straight away. See the link in the post above. Interesting concept, will it catch on are there enough RE readers with Ipads to make to stack up? My concern is the amount of adverts in the mag, 20 pages in the modeller section last month with only 11 ! of actual model related pages. I know the ads pay for the mag but 31 pages in and only 11 are actual of interest to the reader is taking it a little to far in my view. On a more positive note, excellent mag again. Will you be commissioning any models yourself or is that being left to Rail Exclusive? Many thanks for the comments. I’ve just counted up and I only have 15 pages of adverts in the last RAIL EXPRESS Modeller supplement and 17 pages of editorial. I know there are occasions when we have pushed 20 pages, which is a nice position to be in as it all helps pay for the additional costs that come from the high quality paper that we use for the magazine compared to rival titles. However, I am aware that it makes the magazine slightly unbalanced. The difficulty is that due to printing restrictions we can only really increase the pagination in sections of eight, eg 24->32->40->48 etc. At the moment 40 pages is a step to far for us while we are still finding our feet with a new publisher, but who knows what the future might bring if things continue to go well on the advertising front! Regarding limited edition models, we haven’t ruled them out. I have had a lot of people get in touch, especially people who have purchased every single one, saying that they would like to see the RAIL EXPRESS branded range of models to continue. I trust the RE brand to deliver top notch models like the DRS 37’s etc. Shame Rail Exclusive took the new 37’s. Maybe a reworked 67??? 🙂 with Hornby or something similar or even wagons/coaches (as you said in this months REM). At the moment the Rail Exclusive site is very very basic no information on the project. Hopefully when they settle into life on their own the website will be built on. How about given current paper format subscribers a trial 12 months or even 6 months of the Ipad format? And assurances that ‘mag’ wont go digital only in the long term. Perhaps a reworked Hornby Class 73 to similar quality to the class 56 & class 60’s to go with all the new EMU’s? As there are a wide range of liveries surely this model is a high priority for some people. I would get a FGBRF one, an old Railtrack Blue/Green 73/2, a new Gatwick Express one & BR Blue one. Yep, I think the Class 73, along with the Class 67, are absolute no brainers. I can’t work out why these haven’t been announced by anyone yet. how about doing/looking into an iphone app too? I think the Zinio app works on both? Got it at last, but not dissapointed. Whilst the iPad versions are very commendable I wonder if there is any benefit in returning to the A4 format for the paper versions as before? This would surely reduce production costs and personally I can’t see any advantage in the larger size. I understand this was done for the benefit of photography but I for one thought these translated just as well in the A4 format which made storage and delivery by mail easier and less prone to creasing. The Zinio interface is clunky and not smooth to use – there does not appear to be a save option to keep one’s purchase. It is interesting that the successful online magazines have gone for the pdf format – widely used. It is automatically saved to your account, plus you can download it to your computer if you install the Zinio software. I agree this isn’t a perfect solution, but if we sell the PDF file then what is to stop people just swapping that between their friends! ?